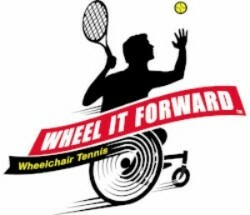 The Whole Person presents the Wheel It Forward Tournament April 7-9, 2019, at the Northland Racquet Club (306 Tennis Ct., North KCMO) for paraplegics, quadriplegics and the ambulatory disabled. This tournament provides a quality wheelchair tennis and adaptive sports experience for people with disabilities and others. Wheelchair tennis players in the region are invited to come to Kansas City to play competitive tennis and win their share of the $4,000 in prize money!! Entry Fee: $95.10 per person. The entry fee includes both tournament play and banquet fee for registering player. There will be the following divisions - A, B, C. Divisions may be combined based on limited draws. Entry Type: Entry to this tournament is open to all USTA members. Entries must be submitted by Monday, April 01, 2019 at midnight (CST). Only USTA members can register online if available. The first 26 athletes that register for the Wheel It Forward tournament will receive a complimentary Roger Federer Wilson double racket, double shoulder, tennis bag. Saturday, April 6: Matches 8:30 a.m. – 6:00 p.m.
Sunday, April 7: Matches 8:30 a.m. – 3:30 p.m.
*Schedule is subject to change due to the amount of tournament registrations. Play schedule will be adjusted accordingly. Players are responsible for making their own hotel reservations. Please contact Rick Haith if you are planning to fly into Kansas City to play in the tournament. All parking is located on the east side of the Northland Racquet Club. There will be a parking greeter that will assist you in finding a place to park. Only USTA members can register online if available.